Paid off my overdue book fee (a whopping $1.40 fine). I can borrow books from the library again! -Everneath by Brodi Ashton: I LOVED this book when I read it last year!! I just needed my own shiny copy. Can't wait for Everbound! 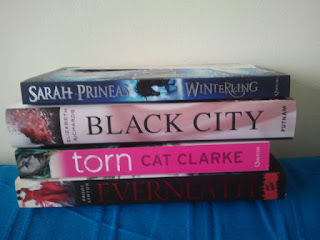 -The Goddess Inheritance by Aimee Carter: YAYYYY!! You better believe I squealed when I saw this on NetGalley! The cliffhanger ending of Goddess Interrupted nearly killed me! -Crimson Frost by Jennifer Estep: I really liked the first three books in this series! Yay mythology! -Right of Way by Lauren Barnholdt: I love Lauren Barnholdt's books! This one sounds SO good! -The Cadet of Tildor by Alex Lidell: Described as Tamora Pierce meets George R.R. Martin, COUNT ME IN!!! -Shadow on the Crown by Patricia Bracewell: an overlooked period of history?? YES PLEASE! Also, I get to pick up Going Bovine by Libba Bray, Looking for Alaska by John Green, and Where She Went by Gayle Forman tomorrow! It's going to be one big YA party! -The Long Walk by Stephen King. -A Dance with Jane Austen by Susannah Fullerton. My boyfriend's parents sent me this one since I love Jane Austen and I love to dance. They love sending us non-fiction Jane Austen stuff...I'm actually curious how many more books of this stripe they'll be able to find. -Quiet: The Power of Introverts in a World That Can't Stop Talking by Susan Cain. I bought this for myself on my birthday because I forgot to put it on my list. I finished it the other day and it was magnificent. 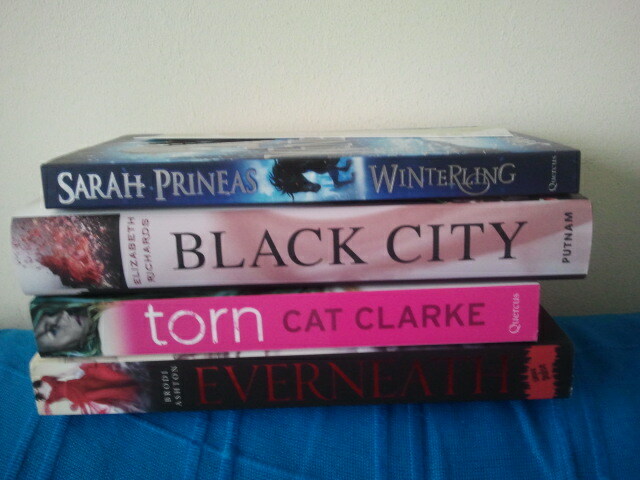 Amazing books...I really need to pick up The Fault in our Stars and I think I need to read every book in Bridget's pile! So many great books. I see all these Sarah Dessen books and it makes me feel silly that I have yet to read a single one. Bad blogger! Oh The Fault in Our Stars...huggles John Green. 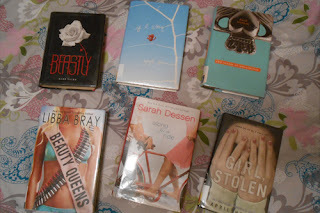 You must read a Sarah Dessen book soon! They're amazing. I promise! Great books! And yea for libraries! See several of my favorite authors in all of your hauls, so hope you guys love them as much as I do. Enjoy! So many great books. I get teary-eyed when I see TFiOS and If I Stay. Be prepared friends, be prepared. I have tissues ready for TFiOS! Jen: Can't wait to see what you think of Sarah Dessen's book. I just finished my first one yesterday, Along for the Ride. Also, The Fault in Our Stars is absolutely amazing, if you love John Green already, this one will not disappoint! Enjoy! Kelly: Oh wow, Beastly is a great book and an awesome twist to the classic fairy tale of Beauty and the Beast! Holy crap, If I Stay is one of my favourites and it's a very well told contemporary. It's awesome!! I just finished Along for the Ride, it was my first Sarah Dessen novel and it was a great one. Hope you enjoy it as well! Rebel Angels! I have so many thoughts on that series. I can't wait to see what you think once you've read the third book, Jen! And Cadet of Tildor - YAY. I'm about to start this one, Daisy :) Oh my gosh, Kelly, have you not read If I Stay? I'm not the only one? I really need to start it, hah! Bridget, that's so cool about your boyfriend's family and the Jane Austen thing - my boyfriend's family does the same with anything London, hah! Fab books, ladies - hope you enjoy! TFIOS and Rebel Angels are both so, so good! I've been dying to read Bossypants since I love Tina Fey. Unremembered and the Cadet of Tildor look really awesome. Beauty Queens and Going Bovine are both absolutely fantastic, especially Beauty Queens. Libba Bray is just a genius. And Looking for Alaska is one of my favorite books ever! Kelly, I loved Beastly! The movie is good, too, but the book is so much better. I hope you enjoy it! Great books! Everyone who's check out A Fault in Our Stars has LOVED it! I'm so jealous of Black City! I can't wait to get it in at our library. Great choices. Happy reading. 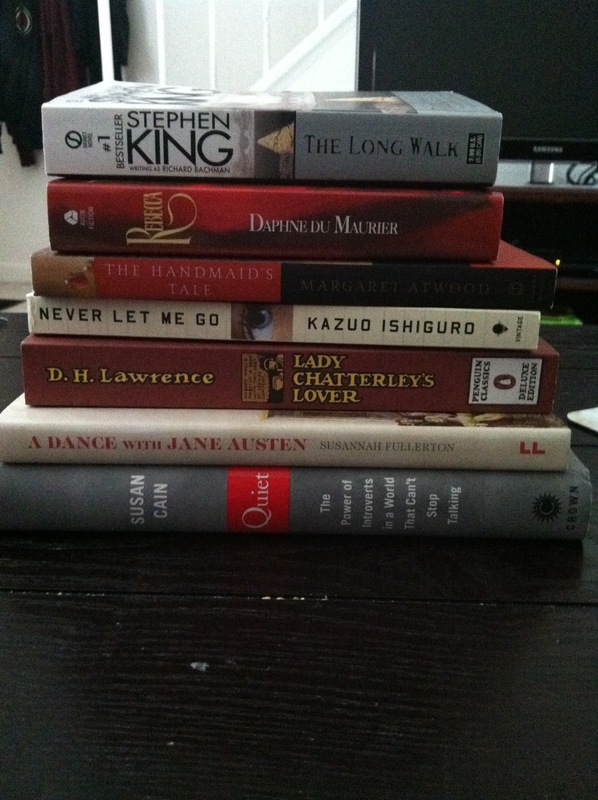 Wow awesome book hauls! So jealous :D Enjoy all of the books! Can I say how much I love your YA-stickered haul, Jen? I am constantly pulling out books like this on the subway. I try to do it proudly! Bridget: Your list is fab - 2 of my fave literary speculative fiction titles there in the Atwood and Ishiguro. Rebecca is such a thrilling page-turner too.